Weather like this should not be wasted by sitting at home. 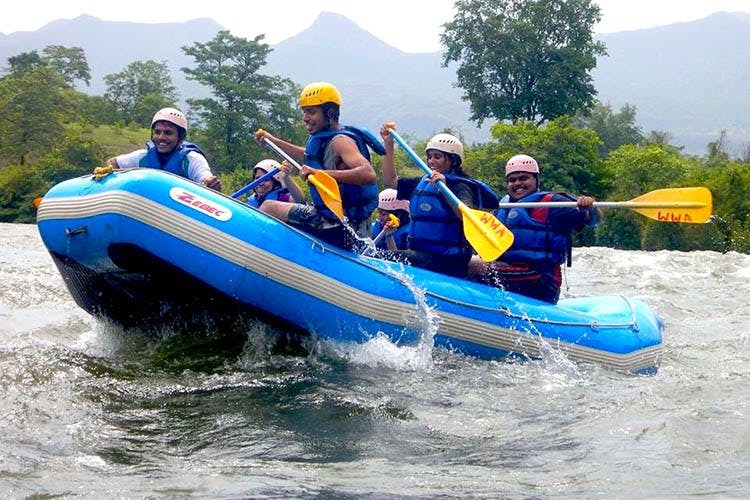 Bring some excitement in your lives and enjoy the monsoons with white water rafting in Kundalika river near Pune. Situated about 100km from Pune, Kundalika river is the hub for white water rafting which is one of the most captivating adventure activities. Rafting in Kundalika river is done in the rapids generated by the water released from the dam. The distance of the rafting program is around 11km with 10 rapids ranging from grade 2 to grade 3. The weekday charges for rafting are INR 775 per person and on weekend it is INR 1600 per person. The duration of this is approximately 1 hour 45 minutes depending on the flow of water. Children under 14 years of age are not allowed. With the growing popularity of Kundalika river, many small and beautiful resorts have come up around the river where you can enjoy your stay with family and friends. Its proximity to Pune and many other places to explore around it including Raigad fort and Kashid beach, makes it the perfect place for an amazing weekend. So take out some time from your busy schedules, get your bookings done, prepare yourself for the fun and adventure and enjoy the thrilling experience of river rafting at Kundalika River. Wear comfortable clothing and footwear you can get wet in. Carry towels, change of clothes and water bottle.